I can pretty safely say that I had never had cheese cooked as a sauce growing up. When we were still living in Japan, I asked my husband, my boyfriend back then, what kind of food he used to like as a kid. One of the answers was Macaroni & Cheese. I simply could not picture how melted cheese could coat macaroni nicely without curdling or getting partially lumpy or chewy. Moving to the States, I was so thrilled to finally try Macaroni & Cheese. Yes, that one, the one that comes in a dark blue box with a picture of vivid orange macaroni. I don’t deny that at that moment I did not know how to react, but after a few scoops, I loved it. I still believe that orange powder that comes in a packet has something that’s mentally addicting. With the love for instant Mac & Cheese growing in me, I started making my home style Mac & Cheese. Observing tons of great food bloggers’ and food web sites’ recipes, and of course with errors and corrections, this is so far the best one of mine. I put it in home made deep dish pizza and topped it off with Basic Italian Tomato Sauce. 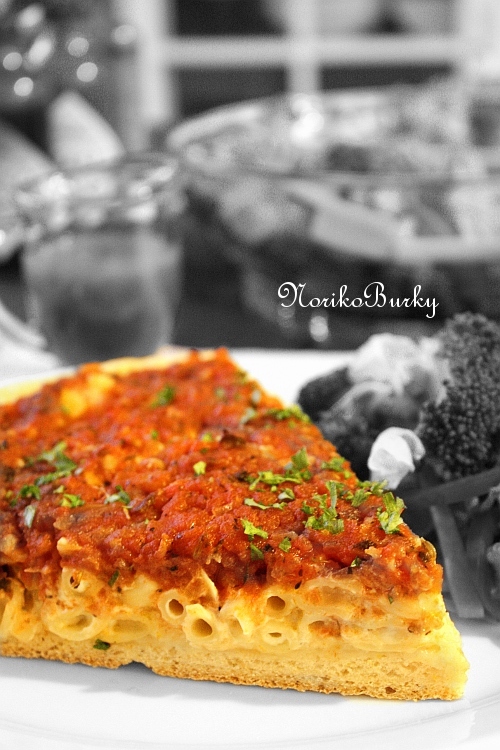 Hearty and fulfilling homemade macaroni & cheese. Cook macaroni to al dente according to the package instruction. Drain. In a 3 qt. pot, heat all the rest of the ingredients over medium heat. Add cooked macaroni and combine well. 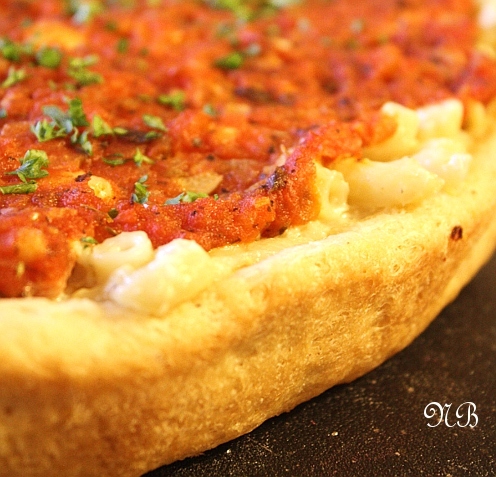 This stuffed pizza was a big hit in my family and has become one of our favorite combinations right away. I put chipotle TABASCO on my slice. I’m not a big fan of original TABASCO but this chipotle one is a completely different classification of hot sauce in my opinion. Its smoky fume and mild spiciness adds a fantastic but not over-powering kick to this delicious meal.